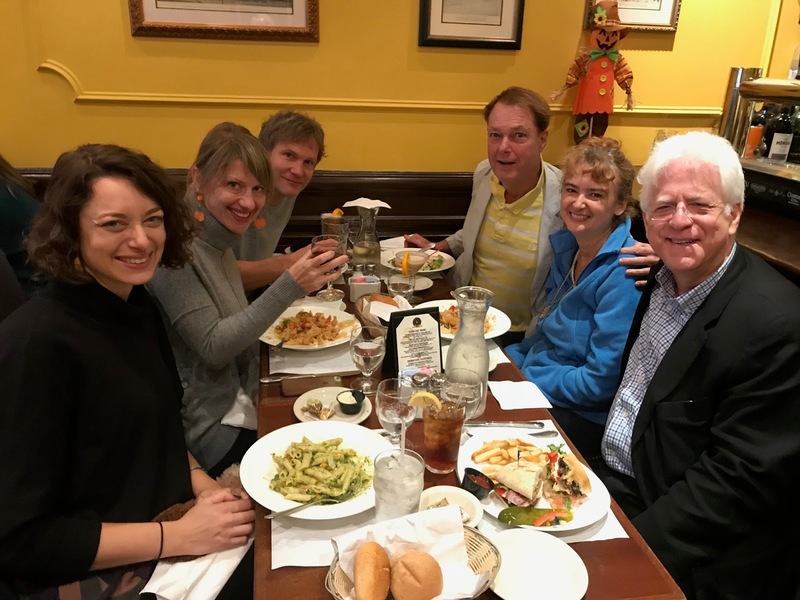 I've started to cut back a little on my trips on the film festival circuit these days, I got invited to two very appetizing festivals that took place last week. 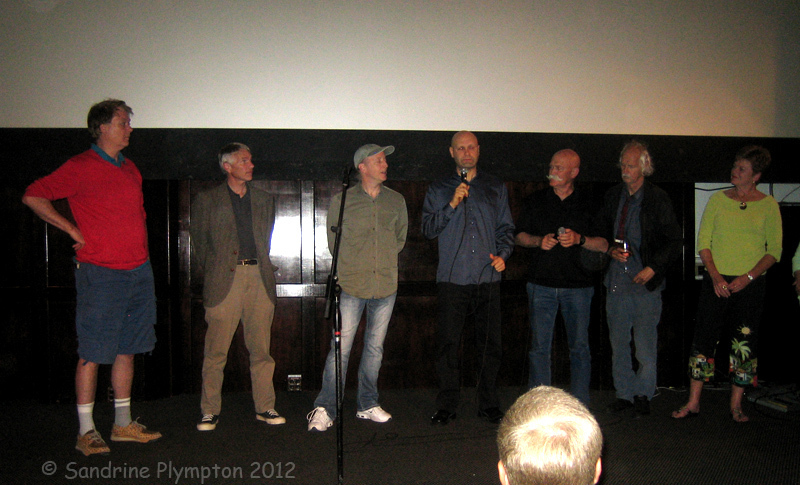 The first was the Santa Fe Independent Film Festival. I'd never been to New Mexico before, so I thought it would be interesting. The place is 7,000 feet into the mountains, and it has a very classic look to it. All the buildings must be made from adobe or at least look like it. And all the shop signs must have only two colors (no rainbows allowed, and obviously no Taco Bells) The festival is run by a young family with lots of energy, and they took very good care of me. The cinemas were all cool, classic-type theaters and there were lots of volunteers offering to do anything I needed - and the Hotel Santa Fe was perfect - very comfortable. Then at the big ceremonies I was given a Lifetime Achievement Award that included a freshly-baked peach pie in a ceremonial pie tin. While I was there, I was able to visit Los Alamos, where the atomic bomb was developed. I toured the scientists' houses and learned the history of the bomb, I found that fascinating. Next, I flew to Oregon for the Portland Film Festival. This festival has now taken over a huge canning warehouse that's been converted into a headquarters, lounge and multiplex. 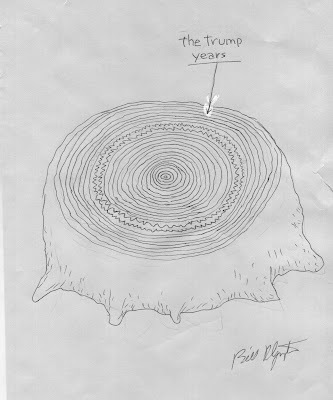 I saw a fascinating film called "Behind the Curve" about people who believe that the earth is flat, and that the theory of a round earth is a conspiracy from the dark state. The group is actually quite large, over 1,000 members, and very serious. 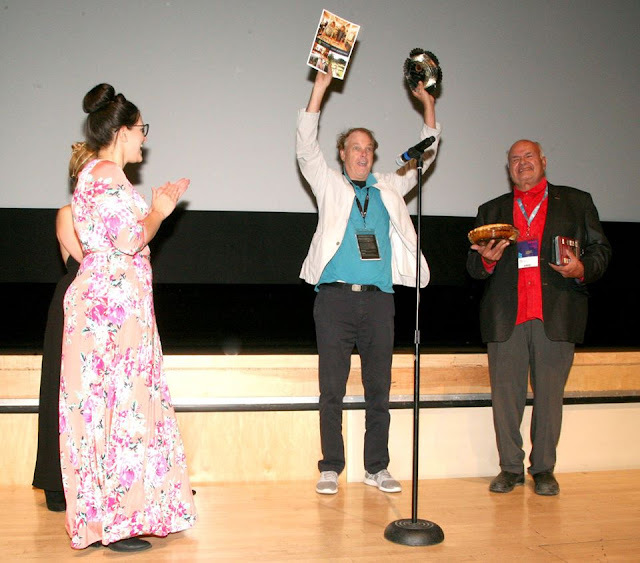 The PDXFF is a lively festival with lots of energy and ideas, created by Joshua Leake. I highly recommend both of these festivals if you want a great experience watching work that is totally off the mainstream. As soon as I returned from my trip, I joined my fellow Academy members for a two-day judging of all the animated short films that are eligible for the Oscars. It was fun to see all my fellow members and watch this year's crop of the best animated shorts. 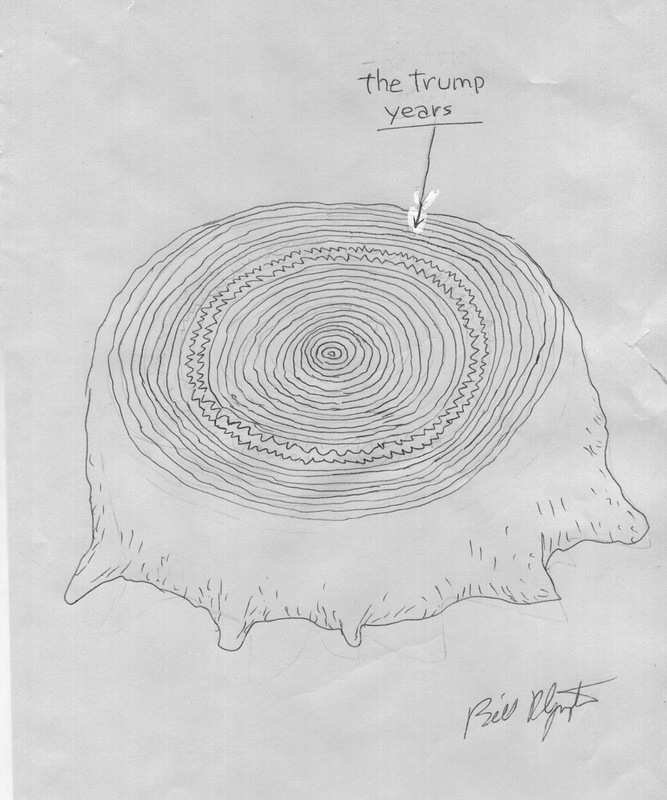 I also entered my very short film "Trump Bites: The Unraveling" so we'll find out in January if people like that. Also, speaking of the atomic bomb, I've done some graphics for a new Off-Broadway called "Nuclear Follies", directed by one of my favorite voice actors, Daniel Neiden. He provided the voice of the main character, Del, in my first animated feature, "The Tune". I haven't seen "Nuclear Follies" yet, but I know Daniel is a very funny fellow, so it should be hilarious. 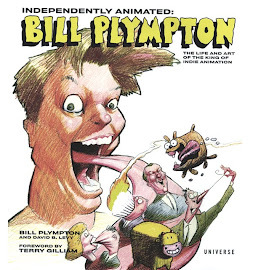 You may even see some art in the show that looks a little bit "Plympton-esque". I also heard that tickets to the November 6 performance will be FREE if you vote. Which you should do anyway, so, really, there's no reason NOT to vote and then enjoy a great night at the theater! I hope to see you there. If you like your comedy dark, then that's the place to be. Happy Halloween, everyone - and here's my cartoon of the week. 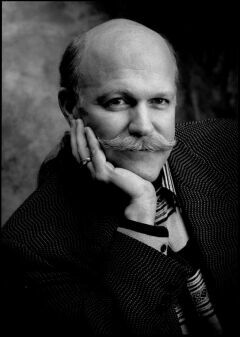 I just learned the sad news about Will Vinton's death. 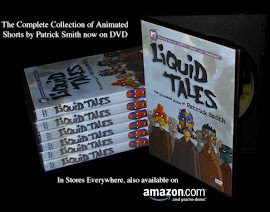 In the 1980's and 90's he was a real force in animation and a magnet for creative artists to move to Portland, Oregon, which helped make it the Mecca of animation that it is today. I first met him way before I got into animation, back in the late 1970's or early 80's, on one of my annual trips back to Portland, my hometown. I desperately wanted to get into the field, so I though I'd just visit his studio, unannounced and uninvited. Back then his studio was based out of a little house in N.W. Portland. 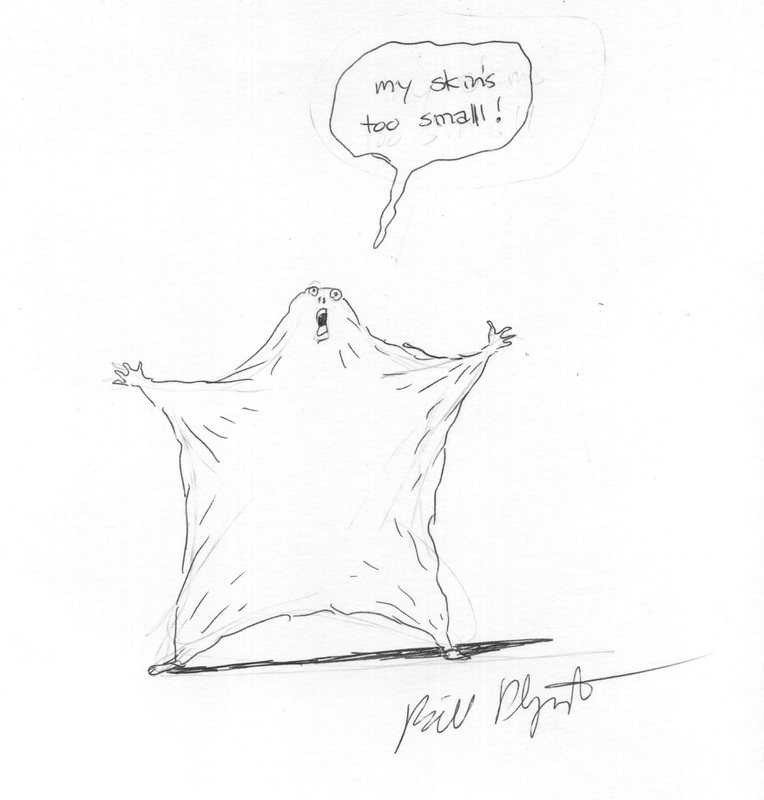 They were the friendliest people: Mark Gustafson, Joan Gratz, Craig Bartlett - I guess they'd seen my illustrations. I would usually visit Will whenever I was in town and they'd give me a tour of their quickly-growing studio as they went from short films to features, to commercials and T.V. shows. 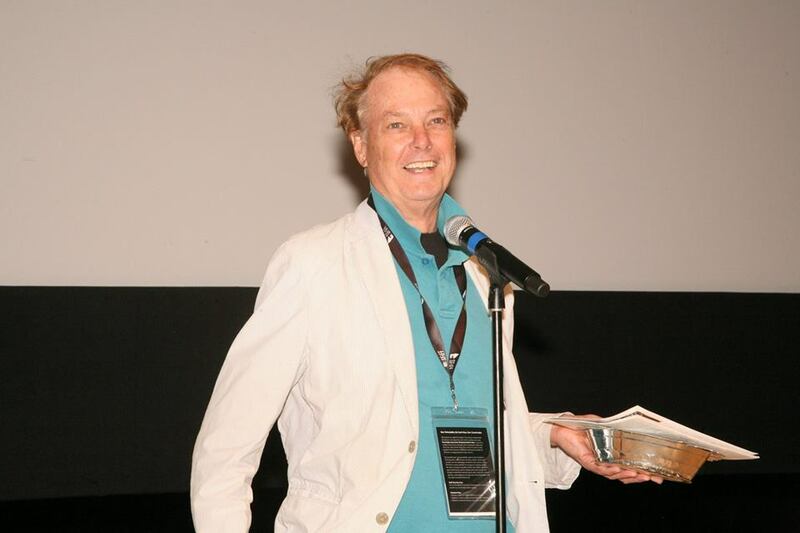 Will became famous after he received an Oscar for "Closed Mondays", the short film he made with Bob Gardiner. And I became closer friends with Bob later on - Will and Bob split up for creative reasons and after a while, Bob became extremely jealous of Will's huge success. I used to hang out with Bob in the bars of Portland, he loved to drink, and would rail against Will's success. It's my theory that Bob was sort of the real genius behind Claymation - he was an extremely talented artist, musician and storyteller but like a lot of artists, he was very disorganized. So Will took over the production, post-production and distribution, and therefore became in many ways the key to their film's success. Will was definitely a genius when it came to sales, promotion and attracting talent - Will drew some of the greatest 3-D animators in the U.S. and through Will's fabulous talent, his studio rose to the great heights of animation success. Then, the story goes, he got two TV shows side-by-side - "The PJ's" and "Gary and Mike", so he had to expand the studio immediately. He was taking over more Portland real estate just to shoot more stop-motion, so in order to keep his studio going, he turned to his friend Phil Knight of Nike fame for a big loan. Unfortunately, both shows got cancelled in quick succession, so poor Will was stuck with a huge unpaid loan. Phil Knight knew that his son, Travis, who was a great animator working for Will, wanted to make feature films, so Phil Knight and the board that ran Will's studio turned the studio over to Travis, and Will instantly found himself without a studio. Gradually Will Vinton Studios became Laika, producer of "Coraline", "The Corpse Bride" and "Kubo and the Two Strings" fame. I never could figure out why, if Will was able to build Will Vinton Studios so quickly, after losing control of it, why couldn't he do it again? He was so great at promotion, gathering talent, sales and producing, plus he had a big name and reputation in the business. But it just didn't happen. 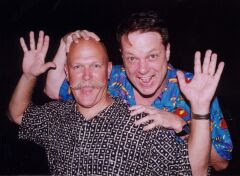 With Will Vinton at the San Diego Comic-Con in 2006. I visited his house about 7 years ago, and he took me water-skiing on the Willamette River - he was very athletic for his age. We then went out for dinner and he complained to me how he had 50 shows that he was trying to sell, and couldn't find a buyer for one. This was very mysterious - the great Will Vinton couldn't make a sale? It didn't make any sense to me. I heard he had a producer's read-through of one of his Broadway show ideas, called "The Kiss" to attract investors, and it didn't go very well.